You’ve heard the expression work smarter, not harder. In the industry of warehousing and material handling this is very true. 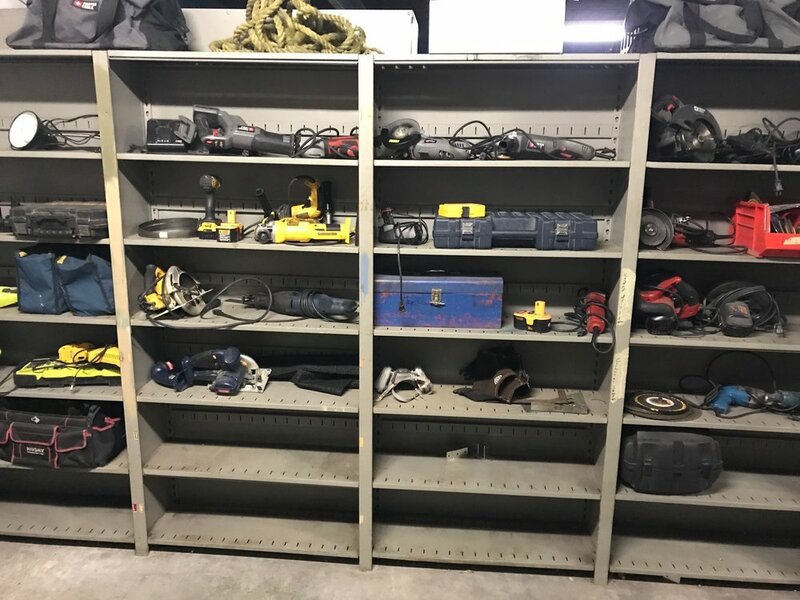 In almost every warehouse application there at least 1 more piece of equipment that could be utilized to make the job safer, more efficient, and easier. There’s ALWAYS room for improvement. Fortunately in the material handling industry, we obsess over what products our customers can use to do just that. Today, I’ll share 3 types of small warehouse cranes. One of these could be that missing piece you’re looking for: The Jib Crane, the Gantry Crane, and the Jib Crane Accessory. 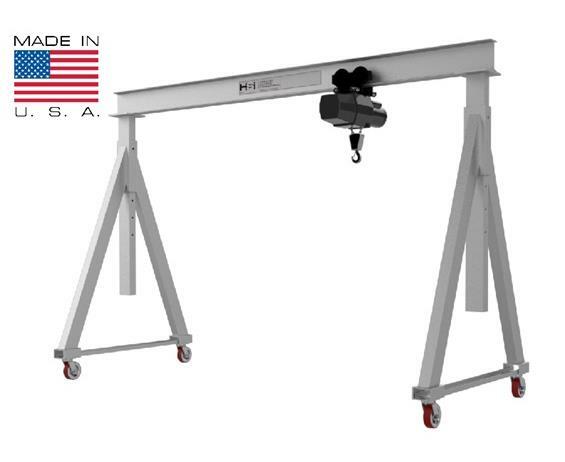 The Jib Crane reaches forward and has a counter balance in the back for stability. These cranes are ideal getting into hard to reach areas. Automotive mechanics will use these to lift and drop engines. Check them out. The Gantry Crane is an overhead crane. They are portable, the frame can be a fixed or adjustable height, and it is available in many different capacities. 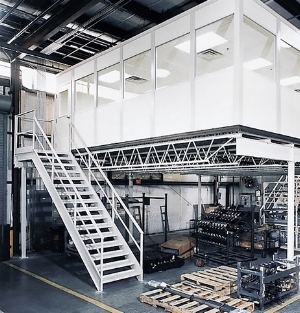 These are ideal for manufacturing and assembly facilities that require movement of heavy material. The last piece piece I’ll share is a crane accessory that can be hooked right on to your forklift. This item is called the Orbit Telescoping Jib Crane, by Vestil. If you already have a forklift this could be a great option to increase the versatility of your material handling capabilities. The jib connects right to the forks and has adjustable lengths and angles. See it in action here. Regardless of what size operation you are, it is always important to continuously improve. And in material handling it is our goal to provide innovative ways to make your experience in the warehouse safer, more efficient, and more profitable. Until next time, be safe and work smarter… not harder. For some, organizing is easy. It’s just ingrained in their nature and they’ve always had an organized, orderly mindset. For others, including myself, it is not so easy. I can remember a few examples growing up. My room was always dirty; I never did laundry; my car had nothing but trash, clothes, and papers piled up everywhere. As I scrambled through the pile of mess I called a binder, the girl next to me turned right to her notes for November 3rd that she had so cleanly labeled and organized and found the answer immediately. I was not as successful. I believe my grade for that test was a 25. Like a 25 E. Embarrassing. Organizing your warehouse, whether you have the knack for it or not, can be done. It just takes a little effort and guidance. Below are 3 simple strategies to organize your warehouse. This is the easy part. It requires very little thought. If you have trash throughout the warehouse, throw it away. Sweep up the dust and loose papers, and throw them away as well. Simply taking out the trash makes a huge difference and it is so easy. Take a look at all the inventory and material you have and determine: What do I get rid of? What do I keep? and Where will it go? If you have a big warehouse this may be overwhelming. So allocate your warehouse into sections and work one section at a time. Start with one run of shelving, finish it completely, and move on to the next. Let’s say you have a run of 5 shelving units. First, empty out all 5 units. Literally take everything off the shelves. Next, dust the shelves off and only put back the items that need to be there. For all the remaining items, put them off to the side to either be sold, scrapped, donated or relocated. From there, repeat this process for all other sections of the warehouse. When was the last time we used this? What is the worst case scenario if we get rid of this? Keep only what is essential. And store seldom used items in a long term storage space. Sell any items of value. Craigslist and Facebook Marketplace are great for this. Donate items to goodwill. Make sure you get a receipt. You can get a tax write-off for most all items you donate. Scrap the junk. Just get rid of the items of zero value that are taking up space. It may seem hard at first, but it’s quite liberating. If it’s made of metal, take it to a scrap yard. Trash the rest. As new items come into your warehouse, remember to keep them in order. Put them in the right place. If they need to be sold, scrapped or donated do it right away. This part is also simple and easy. Just remember to stay on top of it. That’s it. If your warehouse starts to get cluttered again, repeat steps 1 through 3. FYI I just did this myself with my warehouse. It’s nothing special, but it was a simple enough task that anyone can do it. And my goodness, it makes a huge difference. 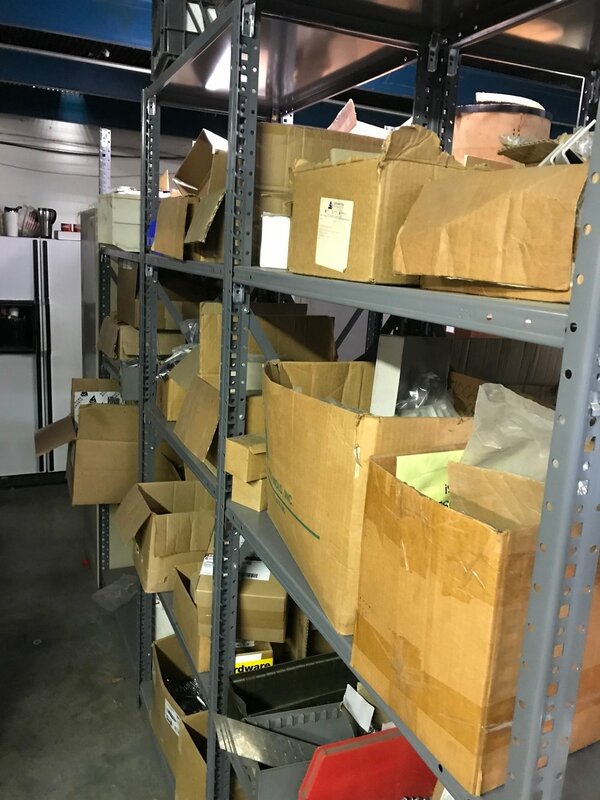 We just recently we had a customer relocate their warehouse. The current warehouse was stacked to the brim. All of their pallet racks were stocked, and even their aisles were stocked with material. It was a logistical nightmare. In fact, they would often have to empty an entire aisle just to get to one piece of inventory. This was a classic case of "We have too much stuff and not enough space"... at all. Luckily for them, they just leased a newer warehouse with twice the space and more ceiling height. They asked us to come spec the new warehouse layout to get the most amount of pallet rack and vertical space, while also maintaining maintaining 15' aisle space to fit their forklift. I submitted a couple drawings for optimum layout and also drawings for beam level elevations. They went with the layout below and option "C" for elevations. It's important to know your minimum aisle width so your forklift can fit. Also, it's important to know how much clearance is required per pallet. We always figure as much information as possible before we start so there are less "bottle necks" on the back end. Another challenge they were facing was that they had to move out of the old warehouse within 3 weeks and have rack ready to install in 2 weeks... A serious time crunch. 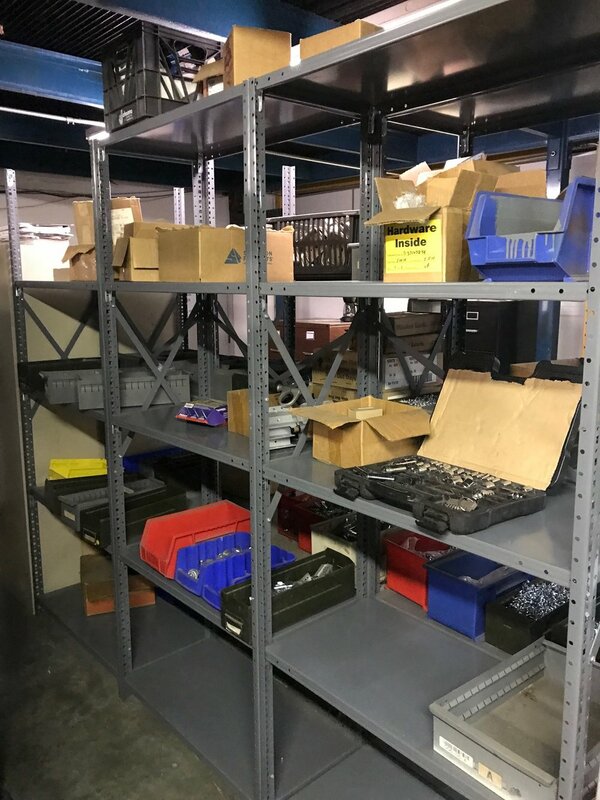 In the end we were able to get the racking delivered and installed with a week to spare. We used refurbished uprights and new beams so we could meet the deadline. The customer now has 2.5 times more space than their previous due to a strategic layout and more utilization of vertical space. What a relief it is! This rack is beastly as well, which is great because the customer needs it. Each beam pair is rated for over 10,000 lbs and upright for over 35,000 lbs. This particular project was a personal favorite because we were able to layout the warehouse, put it into a CAD, adjust the CAD layout, figure out quantities, and provide pricing in real time. Working with the customer from initial design to the finish line is definitely the way to go. It keeps everyone on the same page and the end result is always better. Looking forward to the next one. Hey everyone! Today, I'm blogging a little bit on our Material Handling E-Commerce website, SBM-Material.com. What is it? It's a website where you can browse products specifically for Material Handling, and you can buy them online. These are products you can't find in the local hardware store. These products are specifically for facility operations and material handling (2,500 products total). And, If we don't have the product you're looking for on the site, we will find it for you. If the product doesn't exist, we will have someone make it or we will make it ourselves. Please take a look. And, if you visit the site please email me casey@steinerbmoore.com or info@sbm-materialhandling.com and send me your feedback. We are always working to improved the customer experience. What is our purpose behind this site? Both sites? Our goal and mission in our main website and our material handling e-commerce site to do everything in our power (whether it's through product or warehouse design) to make facility operations easy, efficient, and organized. There is always a way to improve your operations. There's always a product, a process, or a design that can make things a little better. And we'll always work toward continuous improvement to both our websites and our own operations to deliver best experience possible. If there's anything you need whether you are a contractor, purchasing agent, facility manager, or business owner (anywhere in the country) you can call up our office and speak to Me (Casey), Chris, or Rick, and we'll chat with you personally. Thanks, and let us know how we can help. That being said, until next time, keep up the hard work. Hey Everyone! Hope the year is going well for your business and operations. Haven't checked in in a while here, but plenty more blogs to come in the future. We'll make this blog more like a vlog. Check out our most recent installation. It shows you a little more in depth on how we outfit warehouses for our customers. 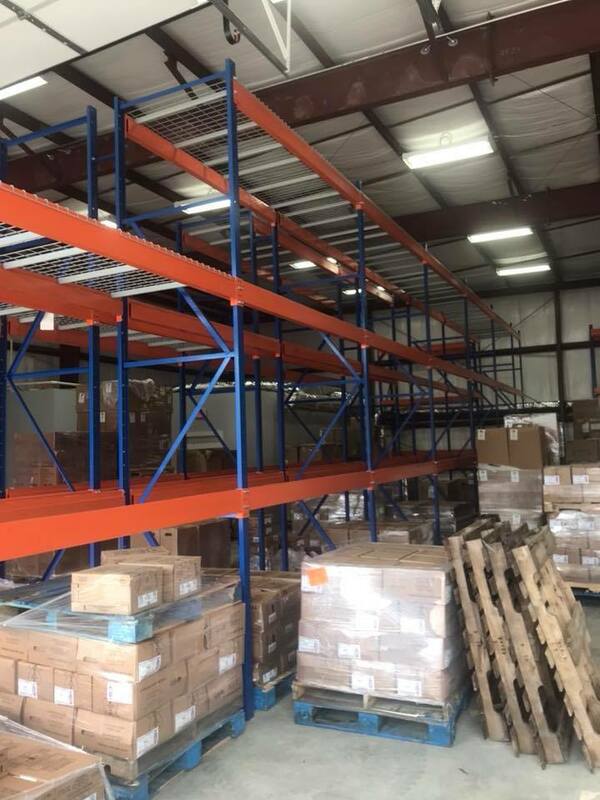 Has some great shelving units, pallet racks, and a mezzanine for this job.